Must be discharged under conditions other than dishonorable. Any veteran who was discharged under conditions other than dishonorable. With certain exceptions, service beginning after Sept. 7, 1980, as an enlisted person, and service afterOct. 16, 1981, as an officer, must be for a minimum 24 continuous months or the full period for which the person was called to active duty. Members called to active duty for 2 years or more, (does not have to be consecutive) or completed the full period for which they were called up. Members who die under honorable conditions or while hospitalized or undergoing treatment, at the expense of the United States, for injury or disease contracted or incurred while performing active duty for training. Members who die under honorable conditions while performing full time AGR service. Members who receive a Hardship Discharge while on active duty. Members discharged due to a service-connected disability while on active duty. Commissioned Officers of the National Oceanic and Atmospheric Administration, Commissioned Officers of the Regular or Reserve Corps of the Public Health Service,WWII Merchant Mariners, and Philippine Armed Forces. A verifiable life-long dependent of the veteran. We follow federal guidelines in determining eligibility for burial. Veteran's military discharge papers (DD-214 or equivalent). No cost for veteran interment ($300 for spouse or qualified dependent). Gravesite, opening and closing of grave and perpetual care. Upright federal government supplied headstone or niche cover. Gravesite and niche locations cannot be reserved. Assignment of graves and niches are without regard to military rank, race, creed, or gender of the qualifying service member and are assigned by next available location. Niches are available for entombment of cremations. The eligibility requirements and costs are the same as full size grave spaces. The niche covers are not big enough for the same amount of inscription as the upright headstones, so there is no space for additional inscription. Internal size is 15" H x 20" L x 10 1/2" W.
Fresh Cut Flowers: May be placed on graves at any time. Cemetery personnel will remove and discard flowers which have become withered, faded, or otherwise unsightly. Artificial Flowers: Are permitted on graves from October 15 - April 15. Flower Containers: Temporary flower containers are provided by the cemetery and may be found in bins located beside the floral regulation signs located throughout the cemetery. Permanent flower containers are not permitted. Columbarium Flowers: Niche flowers may only be placed on the ground below the niches. Any items that are placed directly on the niches or columbarium will be removed and disposed of by cemetery personnel. In addition, due to the limited space provided for columbarium flowers and in order to maintain the beauty and dignity of the area, it may become necessary to periodically “cull” artificial flowers. If this happens, flowers will be removed without prejudice and placed in storage for 30 days before disposal. Within that time, if requested, the assistance will be given families to retrieve those flowers. Christmas Season: Christmas wreaths, Christmas plants, Christmas trees (plants and Christmas trees are limited in height - maximum of 24 inches), floral blankets (maximum size is 2 feet by 3 feet), or flowers will be permitted on graves from December 1- January 15. The Wreaths Across America ceremony is held each year on the second Saturday in December, at 11:00 a.m. (CST). Wreaths have been placed by the Patriot Guard Riders of Arkansas and various veterans' representatives during past ceremonies. Easter Season: Potted plants and artificial arrangement will be permitted on graves 10 days before and 10 days after Easter Sunday. Memorial Day: Gravesites will be decorated with small American Flags placed by volunteers. These flags will be removed immediately after Memorial Day. The Avenue of Flags will also be on display. 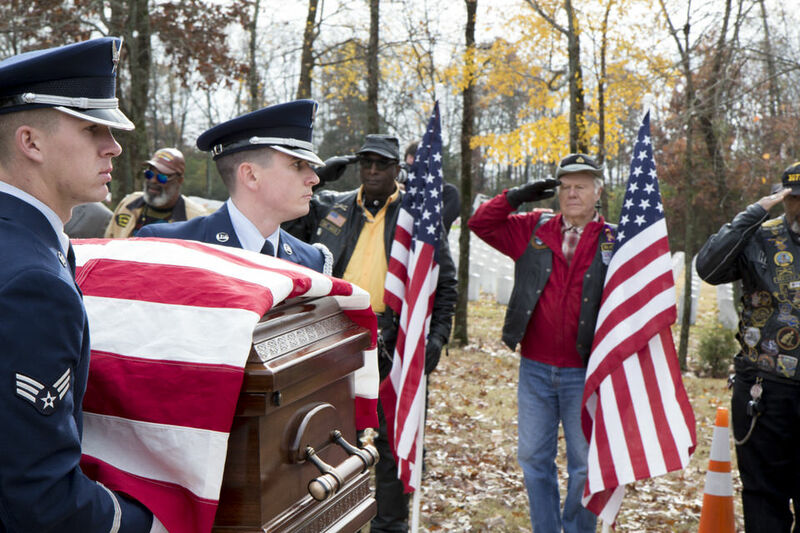 Veterans Day: Gravesites will be decorated with small American Flags placed by volunteers. These flags will be removed immediately after Veterans Day. The Avenue of Flags will also be on display. Unauthorized Decorations: Statues, permanent plantings, pictures, balloons, vigil lights, and breakable items of any kind are not permitted. 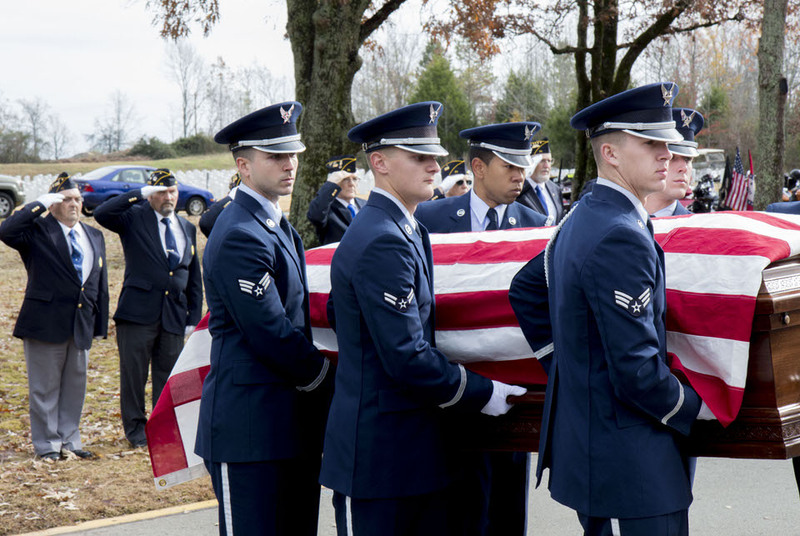 Military Funeral Honors must be arranged and coordinated by the Funeral Home Director and/or the family. The Arkansas Department of Veteran Affairs and the Arkansas State Veterans Cemetery do not conduct or arrange these services.